Part One - What's a telescope for? A big misconception of many an amateur astronomer, starting out, is that he or she must have a telescope. And to be seen without one at a star party just isn't on! This simply is not true. Some of the best views to be had of the night sky have made use of that superior piece of apparatus, the mark one eye ball! Yes you can enjoy the night sky without any optical aid at all. And just because you are into astronomy does not mean you have to spend a fortune on a telescope. I like to think of astronomy as an activity that evolves, starting with the mark one eye ball. After all no optical aid has such a wide field of view as the eye, that's why you can't use a telescope to view a meteor shower, for example. You sometimes need that really wide field of view. I will explain field of view later on. But where the eye fails is in the collection of faint light. If we take a modest pair of binoculars, for instance, they might have an aperture (size of the lenses at the front) of say 50mm. Your eye may only have an aperture of about 5mm. This is determined by the size of the pupil once your eyes have grown accustomed to the dark. Let me take you back to those boring maths lessons. Because we have increased the aperture, from 5mm to 50 we have increased the light gathering power as well, you might think by something like 10 times? In actual fact its much more than that. Now the maths. So this means the area of your eye is 19.6 square mm. Now compare that with the area of the binocular lens, which has an area of 1962 square mm, which is about 100 times more area! This effectively means almost 100 times more light gathering power from the binoculars. Quite a difference! Dont confuse light gathering power with magnification, I will come to that later. The light gathering power is a measure of much of that valuable light, that has travelled so far across space, is collected. The more light collected the fainter the objects we can see and the further back in time we can see. How mind blowing is that? So you can begin to see why, as an astronomer you might want to use an optical aid. And since I mention binoculars, this is an excellent bit of kit to start with. Binoculars, especially those that can be mounted on a tripod, offer great wide field views of the night sky. The Milky Way, our galaxy, is an awe inspiring view through binoculars on a warm summers evening. Plus the added bonus that they can be used during the day too. How do binoculars work then? If you think of binoculars as being two telescopes strapped together, one for each eye, this is basically what they are. In fact binoculars work along the same lines as the first type of telescope I want to talk about here. Please read on and all will become clear! Part Two. The refractor telescope and binoculars, the lens at work. There are about three main types of telescope. And the Cassegrain or catadioptric telescope. The refractor telescope is what most people think of when you mention the word telescope. It's a hollow tube with a lens at one end and an eyepiece at the other. And basically thats what a refractor is. The lens causes the light rays to bend or refract to a point near the eyepiece. At this point an image is formed which is magnified by the eyepiece. Sounds simple doesn't it? Why can't I just get a bit of drain pipe, borrow Grans magnifying glass and stick that at one end, then get an eyepiece and stick it in the other? Well you could, as long as Granny knows! 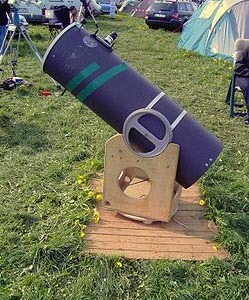 In fact some years back I tried to build my first telescope like that. Sadly it didn't work very well. This is because a single lens works a bit like a prism. I'm sure you remember, from school, seeing white light being split into its separate colours by a prism. The single lens brings the different colours of light to a focus at slightly different points. Blue light closest to the lens, red light further away. It's acting like a lens and a prism. This is most undesirable for a telescope. It causes, what is technically known as, "chromatic aberration" This means that if we look at say the Moon, we would see different coloured fringes around the edges of the Moon. To overcome this problem we can either make the telescope very long - a very very long focal length lens suffers only a tiny amount of chromatic aberration. But this would be quite impractical. So modern refracting telescopes use a compound lens at the front of the tube, which consists of at least two lenses or elements, sometimes more. These elements when put together are known as the telescope's "objective lens". The simplest uses just two elements. The first lens or element is of the convex type (same as Grannys magnifying glass). This is followed very closely by a concave lens. 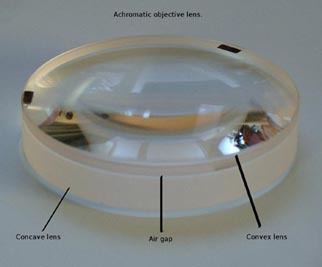 Often the two lenses are bonded together, with a small air gap, so that they appear to be one lens. The idea is that both elements cause the undesirable effect, chromatic aberration, but in opposition to each other. And opposites cancel out (unlike the song!). This type of objective lens with just two elements is called an "achromatic lens". So the two lenses or elements, being of opposite types cancel out each other's undesired effect. 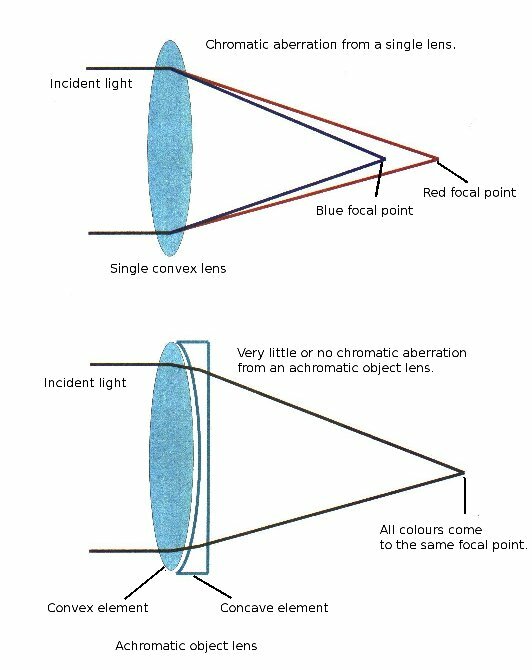 This is how modern refractors overcome chromatic aberration or false colours. Some refractor designs use three elements to make up the objective and these are known as "apochromatic lenses"
Some eyepieces are constructed in a similar way. But I wont go into eyepieces too much here, they deserve an article to themselves. To recap on the refractor then. A refracting telescope gathers light through the compound lens or objective lens. This lens brings the light rays to a point known as the focal point. Just beyond this point an image, which is upside down, is produced. The eyepiece is placed at this point and magnifies the image before it enters your eye. So that the telescope can be focused, it is necessary to move the eyepiece back and forth slightly. The telescope will have a device, called the focuser. This is normally a type of tube mounted on a rack and pinion, which holds the eyepiece and can move it back and forth. The binoculars work in just the same way, except for one extra component. This component is a prism that folds the light rays around inside the binocular tube. This has the effect of making the binocular tube appear longer to the light that is physically and this gives the binoculars the magnification that would otherwise require a longer tube. It also gives the binocular tube that kink in the middle. A reflecting telescope makes use of mirrors instead of lenses to gather the light. Just like the refractor, the reflecting telescope has a tube. But this type of telescope has a curved mirror set at the bottom of the tube and a flat mirror set near the top. 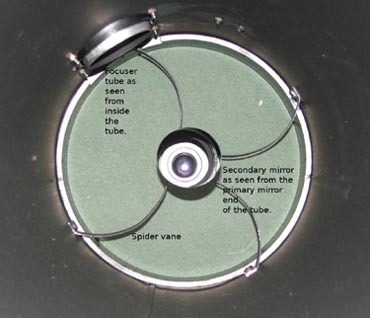 This flat mirror is angled at about 45 degrees to the curved mirror and is held in place by a "spider". This type of telescope normally has one end of the tube open to the air. The curved mirror is known as the "primary mirror", while the flat mirror is called the "secondary mirror" or "flat". The "spider" consists of three or four metal strips, called vanes, which support the secondary mirror in the centre of the tube. This type of telescope was first used by Sir Isaac Newton in 1668 and now nearly all reflecting telescopes are referred to as "Newtonians"
As light enters the a reflector it travels down the tube until it encounters the primary mirror, at the bottom of the tube. 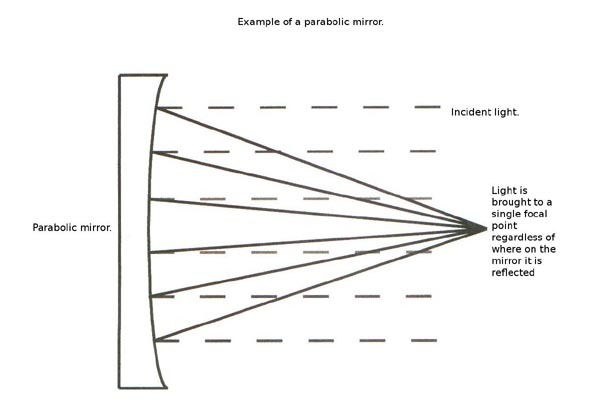 The curved shape of the primary mirror, more correctly known as a parabolic curve, causes the rays of light to converge in a the same way as the objective lens in a refractor. In fact the primary mirror is not unlike the magnifying side of a shaving mirror. The light is then reflected back up the tube until it encounters the flat or secondary mirror. 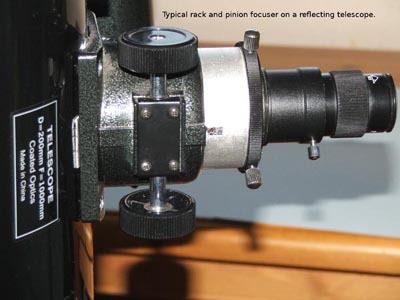 Because this secondary mirror is mounted at 45 degrees to the primary mirror, the light is then reflected out through the side of the tube and into the focuser, where the eyepiece is positioned. 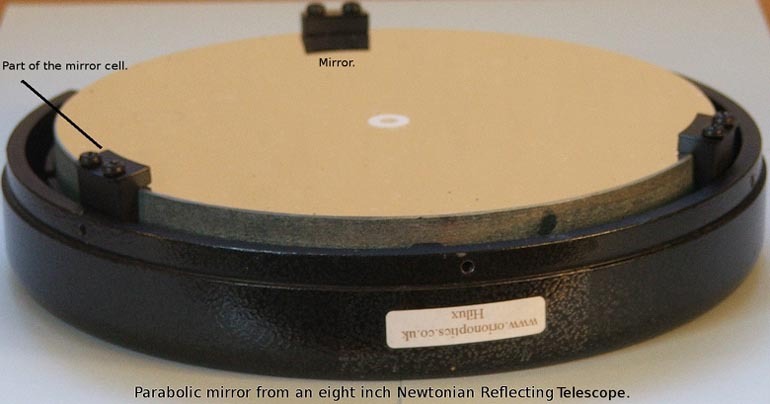 This then is our basic Newtonian Reflector. 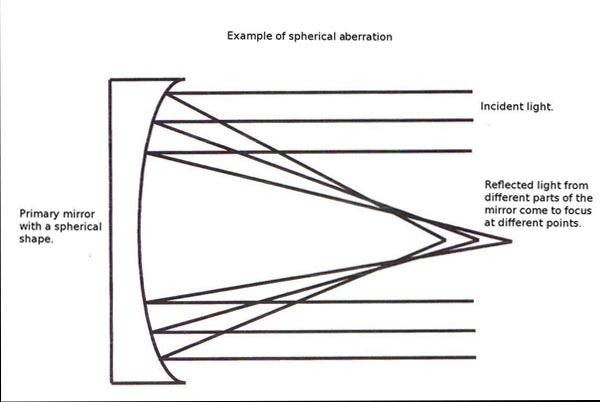 Just as the refracting telescope might suffer the unwanted effects of chromatic aberration, reflecting telescopes can also suffer a form of aberration, known as "spherical aberration". Sounds confusing? Please read on, I will do my best to explain. The primary mirror of a reflecting telescope has a curved, concave bowl shape to it. This shape could be described as part of a sphere. This spherical shape is easy to produce through a process of careful grinding. In the same way that a single convex lens, in a refracting telescope, would bring light of different colours to slightly different points of focus, the spherical mirror would suffer a similar problem. But instead of splitting up white light, as the single lens would, a spherical mirror would have several slightly different points of focus, depending upon where the light has landed upon the mirror's surface. The result of this spherical aberration is a telescope that refuses to come to focus. Stars and other objects remain blurred. To cure this problem, when the mirror has been ground to a spherical shape, an extra grinding process creates a small extra dish shape in the centre of the mirror, known as a parabola. This parabolic shape somewhat resembles that of a satellite dish. The result is to now bring the light rays to the same point of focus, regardless of where the light has landed on the mirrors surface. The result, a telescope that provides sharp images in the eyepiece. The shape or smoothness of the flat or secondary mirror is just as important. It is thought of by some, that a perfectly flat mirror is harder to produce than a good parabolic primary mirror. The accuracy of a mirror or how well it has been ground, is measured in fractions of the wavelength of light. For example, a good telescope would be expected to have been produced to 1/4 of the wavelength of light. To put that measurement into perspective consider this. The thickness of a human hair is about 0.7mm. Visible light has a wavelength of around 0.0005mm. Imagine a fraction of this! But it is obtainable and even budget telescopes almost reach this figure. 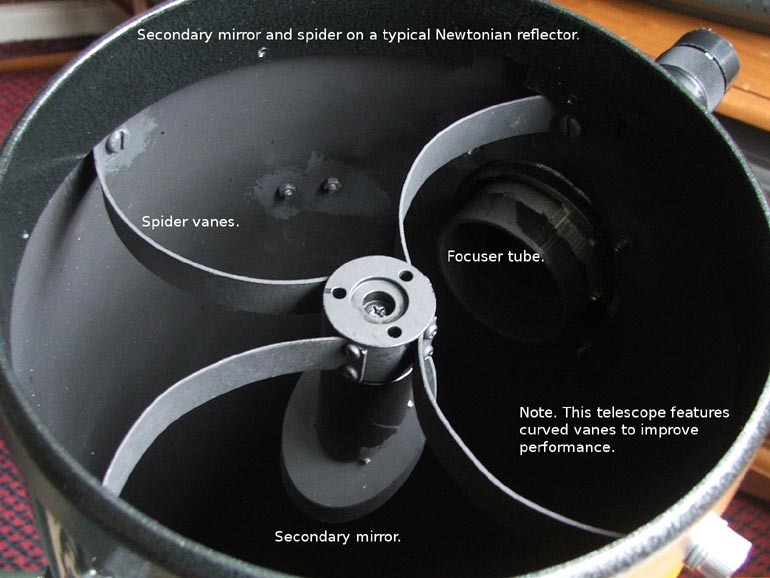 There are various versions of the Newtonian reflector. Some are called "Dobsonians", this simply refers to the type of mount onto which the telescope is fixed. The Dobsonian mount is named after its inventor and is a simple altitude and azimuth mount. The larger reflectors may also have dispensed with a tube altogether. These scopes may use a series of rods or poles to support the flat mirror and focuser section, while the primary mirror is housed in a separate section that supports the rods and sits on a base plate. The focuser of a reflector works in the same way as the focuser on refractors. It's designed to support an eyepiece and has a mechanism to move the eyepiece back and forth to focus the telescope. The reflecting telescope uses mirrors, not lenses, to gather the light and bring the rays of light to a focal point. The main or primary mirror has a parabolic shape to ensure that all the light landing on it's surface is brought to a focus at the same point. Just before this focal point a flat or secondary mirror, which is mounted at 45 degrees, reflects the light out through the side of the tube and into the eyepiece. 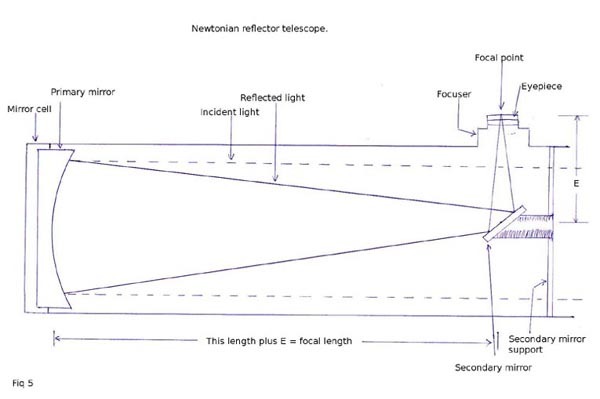 Reflector telescopes can suffer from spherical aberration if the shape of the primary mirror is incorrect. The biggest difference between refractors and reflectors is the available size of the aperture. Reflectors tend to offer the biggest range of large aperture scopes. Part Four. The catadioptric or Cassegrain telescope. Lenses and mirrors working in harmony. Well we have covered the refracting telescope, binoculars and the reflecting telescope. Now let's move onto the most complicated telescope of the three. Catadioptric telescopes make use of the best of both the refractor and reflecting telescopes. They use a combination of mirrors and a corrector plate lens to provide a physically short tube, but with a much longer focal length. The two most popular types of telescope to come under this category are the "Schmidt Cassegrain" and the "Maksutov Cassegrain"
To understand how this somewhat curious design works, it is easier, for the time being, to think of them as a short Newtonian reflector with a type of lens placed across the front of the tube. Also for now I will refer to both types as CATs. Not to confuse this CAT with the furry variety. The CAT has a tube with a primary mirror at the bottom, just as the reflector and a secondary mirror near the top of the tube. The big difference being the secondary mirror. You will hopefully remember from the reflector that we sometimes refered to the secondary mirror as the flat. However with this design of scope the secondary mirror is not flat at all. It has a convex shape, not unlike a lens, but it is a mirror. The primary mirror has the same type of parabolic shape as the Newtonian but with a much deeper dish. This gives the mirror a much shorter focal length. Light enters and travels down the tube until it encounters the primary mirror. It is then reflected back up the tube where it meets the secondary mirror. The light is then reflected back down the tube again, only this time the rays have been focused into a cone shape and through a hole in the centre of the primary mirror. Here they pass into the focuser and eyepiece at the rear of the scope. 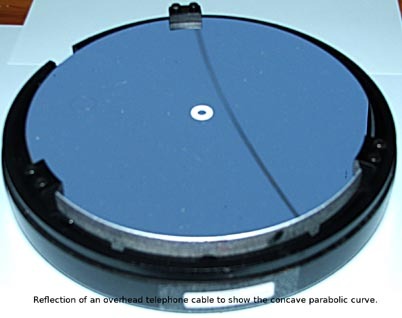 The curved secondary mirror is held in place by a glass plate that fits right over the aperture of the tube. This plate also has a distinct shape to it and is known as the corrector plate. Although a CAT is a very clever design, the very short focal length primary mirror, that it uses, causes some problems. For a start the mirror may suffer from some spherical aberration, because the parabolic shape lies mostly in the centre of the mirror, right where there is a hole. Some designs do not use a parabolic mirror at all. Instead they use a spherical mirror and rely on some divergence of the light rays caused by the corrector plate. This provides the same results as a parabolic mirror. Very short focal length mirrors can also suffer from a problem known as "coma". This can be seen as giving stars an almost comet look about them when they are close to the edge of the field of view. The corrector plate is shaped to provide the same aberrations as the mirror, but in reverse. And just as the the refractor's objective lens uses two (or more) elements, to cancel out each others aberrations, the corrector plate does the same for the primary mirror. In the case of the Schmidt Cassegrain this corrector plate may appear to be flat, but it will have been figured. The convex shape of the secondary mirror causes the light rays to spread somewhat as they travel back down the tube. This has the effect folding the light path and visually extending the length. Although the physical length of the telescope seems quite short. It is not unusual for a CAT to have a focal length that is more than three times its physical length. 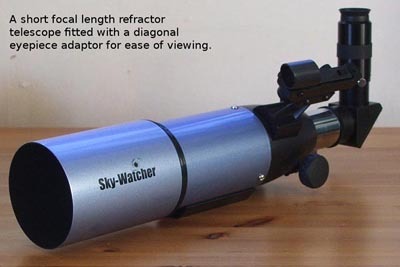 This makes the telescope much lighter and considerably more compact than both the refractor and the reflector. The main difference between the Schmidt Cassegrain telescope and the Maksutov Cassegrain telescope is in the shape of the corrector plate. The Maksutov has a corrector plate with a much deeper dish shape to it. The Maksutov corrector plate is said to have a meniscus contour. One important point to remember about a CAT telescope is they tend to dispense with a focuser, in the normal sense. A CAT telescope instead features a mechanism that moves the primary mirror to focus the telescope. This has pros and cons, but allows the telescope to achieve a much broader focusing range to accommodate many different devices, cameras ect. Both the Schmidt Cassegrain and the Maksutov Cassegrain telescopes fall into the category known as catadioptric telescopes. They make use of mirrors, in a similar way to the Newtonian and a special type of lens known as a corrector plate, which is full aperture. They feature a folded light path, that is to say that the light is reflected up and down the tube several times. This results in a physically short tube with a much longer focal length. Magnification is the biggest mis-seller of telescopes ever. How many adverts have you seen that give unrealistic magnification figures for telescopes? Fortunately this practice is confined to the department store type of telescope. The more serious manufacturers and retailers rarely mention it. Its worth remembering that the magnification of a telescope or binoculars is only one consideration and, in my opinion, by and far the least important factor. So beware! Nevertheless, this is how magnification is obtained by a telescope. The thing to remember is that the telescope itself does not actually magnify. In general the telescope is designed to gather light and the eyepiece magnifies the image produced by the telescope. But certain parameters of the telescope will affect the magnification that the eyepiece can provide. Basically the longer the focal length of the telescope, the higher the magnification a certain eyepiece will provide. For example, if your telescope has a focal length of 500mm and you use a 10mm focal length eyepiece, this set-up will provide 50 times magnification. To work it out we need to go back to the maths lesson! divided by the focal length of the eyepiece. So our telescope has a 500mm focal length, our eyepiece is 10mm. 500 divided by 10 = 50! So the magnification for this arrangement is said to be 50 times. If however, we have a longer focal length telescope, the magnification will be higher for the same eyepiece. The same formula still applies though. The amount of magnification you may need will depend upon what celestial object you are interested in viewing. Basically if your interest is "deep sky objects", then a long focal length eyepiece, providing low magnification will provide the best results. However if you want to view the planets, then you will need a short focal length eyepiece to provide a high magnification. For example, with our telescope of 500mm focal length we want to view Jupiter. We would need to use something like a 5mm focal length eyepiece, to obtain 100 times magnification. But if we wanted to view the Pleiades star cluster with our telescope, we would need to use something like a 20mm focal length eyepiece, to obtain only 25 times magnification. So as a rule of thumb, high magnification for viewing the planets and low magnification for viewing deep sky objects such as star clusters and galaxies. 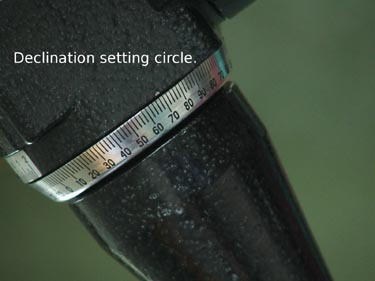 Magnification of a telescope and eyepiece outfit is calculated by dividing the focal length of the telescope by the focal length of the eyepiece. A low magnification normally results in a wider field of view and is useful for viewing deep sky objects. A high magnification is useful for viewing the Moon and planets and results in a narrow field of view. Magnification is carried out by the eyepiece but is influenced by the focal length of the telescope. Part Six. Field of view (FOV). How much can I see? Field of view, as the term suggests, relates to the amount of sky visible through the eyepiece. This again depends upon the focal length of the telescope and one other characteristic, the size of the aperture. And the focal length of the eyepiece. As the magnification is increased the field of view is decreased. That is why when viewing deep sky objects, we normally use low magnification and therefore a wider field of view. The field of view is mostly governed by the size and type of eyepiece. But the aperture of the telescope will also play a small part. Generally a larger aperture telescope will give a larger field of view. To calculate the field of view or FOV we must first know the FOV of the eyepiece we are using. This information is normally supplied with the eyepiece, along with its focal length and is given in degrees. For this exercise I will assume your eyepiece has a quoted FOV of 50 degrees and a focal length of 25mm. divided by the FOV of the eyepiece. For example our 500mm focal length telescope when used with a 25mm eyepiece, will provide a magnification of 20 times. The eyepiece has a quoted field of view (FOV) of 50 degrees. So that is 20 divided by 50 which gives us a FOV of 0.4 of a degree. This means our telescope when used with this eyepiece will let us view about half of a degree of the night sky. That is about as much sky as is occupied by the full Moon. So the Moon would just about fill the whole of the view through this 25mm eyepiece. Field of view, or FOV is an expression of the amount of sky view a given telescope and eyepiece outfit will provide. FOV is largely determined by the eyepiece. But the telescope and its focal length will also play a part, short focal length telescopes offer wider fields of view than long focal length scopes. Generally a long focal length eyepiece will provide the largest field of view when used with a short focal length telescope. 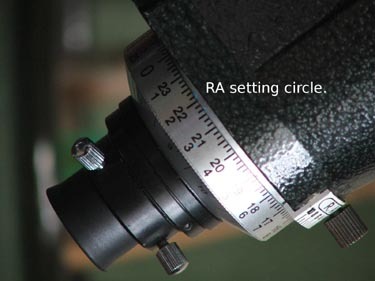 Some eyepieces have been especially designed to provide extra wide and flat field of view. Part seven. The mount. What the telescope sits on. A telescope is not much use unless we have something sturdy to mount it on. I would be quite a wally if I tried to hold my Helios 200mm scope in my arms and aim it at something. It's just not going to work! The mount must allow the telescope to move in at least two directions at once. The telescope must be able to point from the horizon all the way up to the zenith (right over head) and be pointed from east to west and back to east again. It must be strong enough to cope with the weight of the scope, some telescopes can weigh up wards of 40 kilograms or more. The mount must also be sturdy and not wobble or sway at all. One of the simplest telescope mounts around has to be the "Dobsonian", so named after its inventor who specialised in "side walk astronomy", showing the delights of the night sky to the passing public. 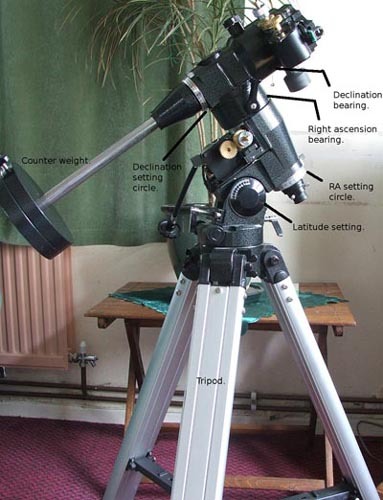 The Dobsonian mount consists of an azimuth bearing, which allows movement from side to side and an altitude bearing that allows the telescope to be angled up or down. The beauty of this mount is in its simplicity. 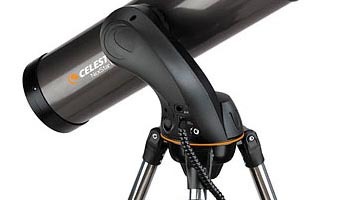 The user simply points the telescope in what ever direction is required. The Dobsonian is best suited to large Newtonian reflectors. Although it could be used with any telescope. The next mount is just as simple. The Alt Azimuth mount is basically a scaled down version of the Dobsonian and designed to be positioned on a tripod. It is the most popular mount for budget telescopes. Again it has two bearings allowing movement in an arc from side to side as well as the required up and down movement. This type of mount is only suitable for small lightweight telescopes. The third mount I want to introduce you to is the "equatorial mount". As the name suggest this type of mount is designed to keep one axis in parallel with the Earth's equator. The other axis is in parallel with the Earth's axis and normally points towards the north (in the northern hemisphere). Why is that I hear you ask? If you have paid attention to the night sky you will have noticed that the stars, Moon, Sun and the other objects move across the sky. For us here in the northern hemisphere they travel from east to west. This movement is due to the rotation of the Earth, we are standing on a rotating platform. If we could draw lines across the sky that show the track objects follow, we would see arcs across the sky. The equatorial mount is designed so that one of its bearings or axes accurately follows these arcs. The axis of the mount that follows this track is called the "right ascension bearing" and must aligned so that it is angled, to the horizontal, by the same amount as the observer's latitude on Earth. The other axis of the mount is known as the "declination bearing". This bearing is at right angles to the right ascension bearing, so the mount looks like the letter "T", but tilted over. If we are using a telescope or binoculars the movement of these objects across the sky is magnified quite a lot. To keep the telescope concentrated on one object, using either a Dobsonian mount or the Alt Azimuth mount, we would require the observer to move both axes' at the same time. This can prove quite awkward, especially if the object is something you want to study or photograph, say one of the planets. Because the equatorial mount has one axis that tracks the paths objects follow across the sky, it is only necessary to move this one axis. With this type of mount it is quite simple to install a motor that causes the telescope to move, slowly but in sync with the movement of the objects in the sky (by objects I mean celestial objects, not man made). Equatorial mounts also allow the user to make use of setting circles on the mount. These setting circles, once set up, will allow the astronomer to quickly find objects using coordinates given in books and magazines. Their use takes practice and is beyond the scope of this article. Telescope mounts come in three main varieties, the Alt Azimuth, the Dobsonian and the Equatorial mounts. The Alt Azimuth is mainly restricted to small light weight telescopes. It has two axes, to allow side to side movement and up and down movement. This mount is normally placed on a tripod. The Dobsonian is very similar to the Alt Azimuth mount, in that it has the same arrangement of bearings. But it is generally designed for larger Newtonian telescopes. It also tends be be floor mounted, not on a tripod. Both the Alt Azimuth and the Dobsonian mounts require the observer to adjust both axes together to follow an objects movement across the sky. 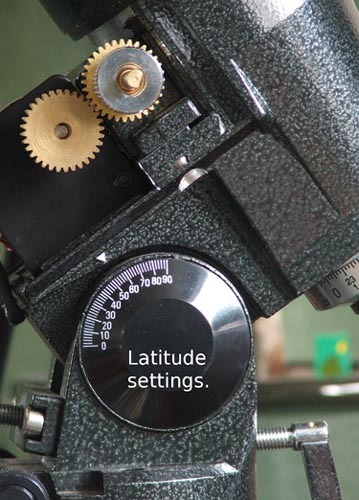 The equatorial mount also has two axes, but has one of them, the right ascension bearing, tilted over. This tilt is at an angle that equates to the observers latitude on Earth. This mount will allow the telescope to follow or track objects as they move across the sky by only adjusting one bearing. The movement of objects across the sky is due to the rotation of the Earth. Well I hope my Beginners guide to 'how telescopes work' has proved both informative and useful to you. Good luck with your hobby and clear skies! 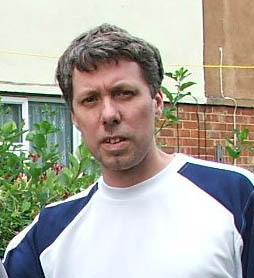 Rob Slack is an experienced amateur astonomer and a prominent member of Swindon Stargazers. On many occasions he has been able to offer practical advice and help to both 'newbies' and to the more experienced amongst us. Rob started out making his own telescopes and later modified them to suit his own particular purposes, so a very practical approach to astronomy has always been key to Rob's philosophy. Also a keen astro-photographer, some of his fine images may be found in the gallery pages of this website.